Heading on a trip to South Korean and wondering what to see in Jeju Island Korea, the unmissable ‘Hawaii of Asia’? Don’t worry – you have come to the right place…Mountains, caves, beaches, hiking, snow and maybe a giant orange or two and weird little stone statues. There is a lot to love here. 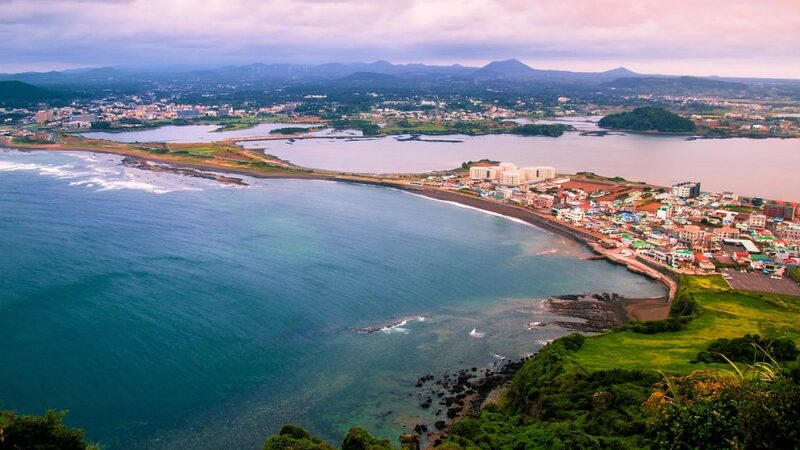 Jeju Island might well South Korea’s biggest domestic holiday destination but for foreigners, this incredible island still very much represents Korea off the beaten track. 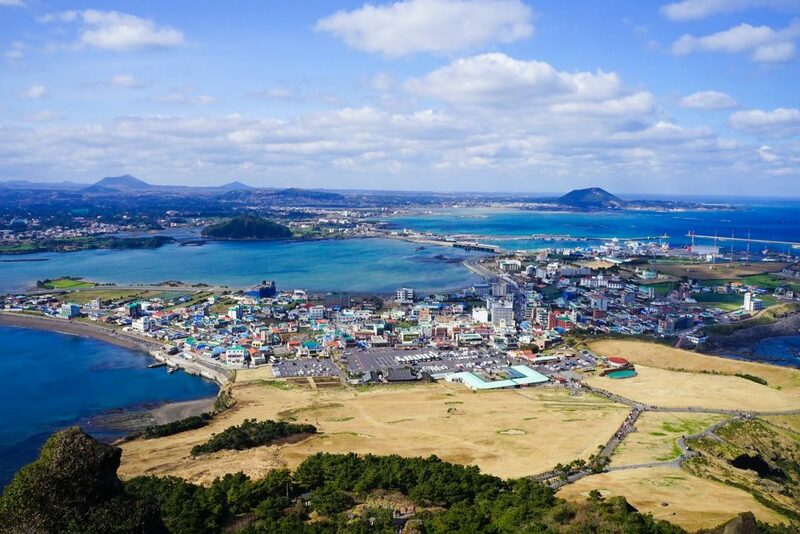 Well read on and you will know exactly what you should see in Jeju, learn all about the best Jeju island attractions and be inspired to fly here at the drop of hat! You will not regret it! 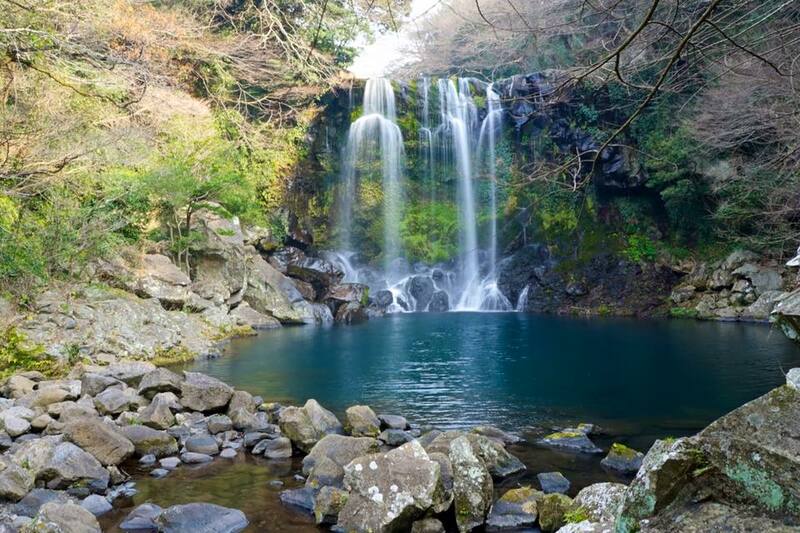 Jeju is the largest volcanic island in South Korea and a premier tourist destination boasts mild weather, as well as scenic beauties of beaches, waterfalls, cliffs and caves! In 2012 (the most recent year I could find! 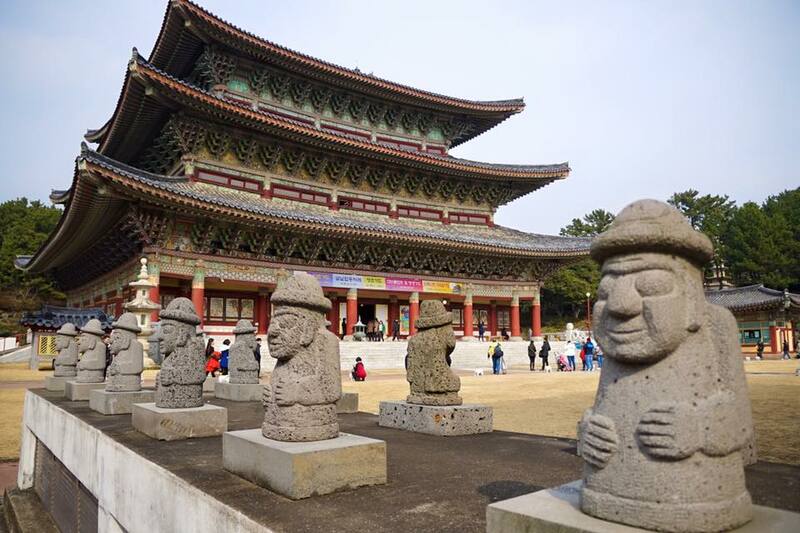 ), 11.1 million foreign tourists visited South Korea, making it the 20th most visited country in the world, and the 6th most visited in Asia…And yet ask almost anyone in the West and they will have zero clue what or where this amazing place is! I found my accident when searching for a cheap way to get from Shanghai to Seoul (was cheaper with 2 separate tickets with a Jeju stop!) 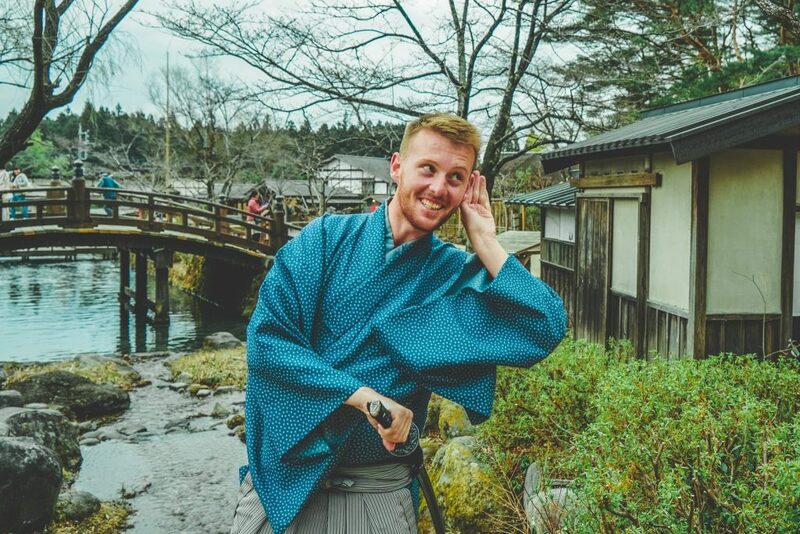 and WOW – It turned out to be one of my favorite destinations ever, like an exotic Hawaii – With less swimming and more outdoor activities (and a host of crazy, CRAZY museums!). 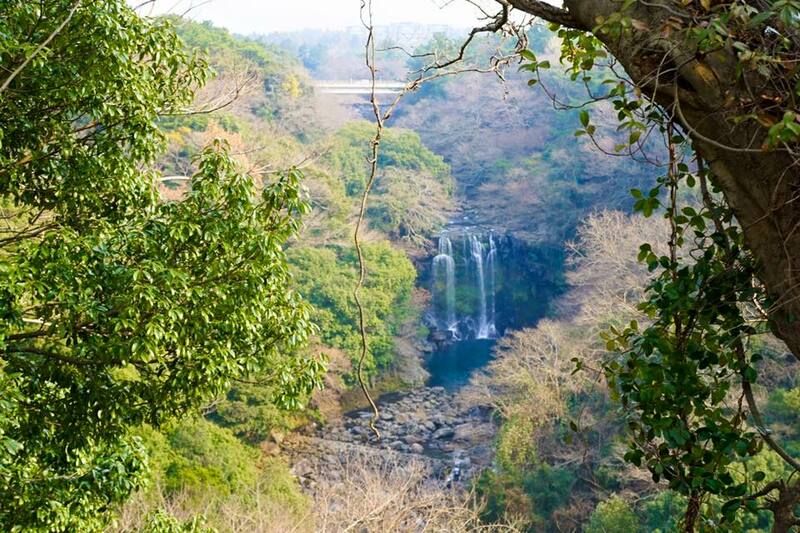 As Jerusalem is the only three-crown holy city, Jeju is the UNESCO’s only triple-crown winner: World Natural Heritage + Global Geopark + Biosphere … and also has been selected as the New7Wonders of Nature! So … I’m going to list the top fice Jeju Attractions for you to inspire for your next East Asian trip. Don’t worry – Jeju island might be huge but thanks to their great public transport and armed with the best SIM card in Korea to get real-time transport information you won’t have any issues getting around! This is by no means definitive and I can’t wait to go back and explore more and who knows, maybe I’ll see you there! Seongsan Ilchulbong Peak is one of the most iconic places in Jeju, and its photo is often seen on postcards and promotional material. 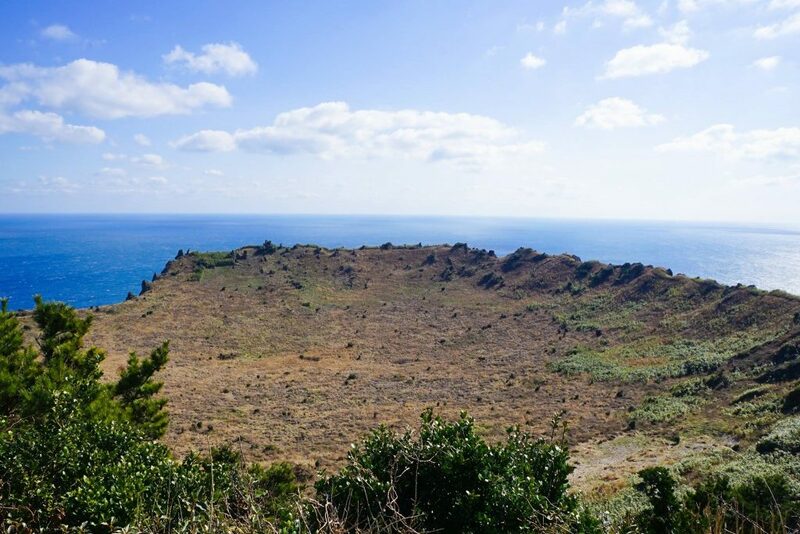 Located on the eastern end of Jeju Island, it is an eroded volcano complete with a crater at the top of Seongsan Ilchulbong Peak that rose from the sea over 100,000 years ago. I didn’t really capture it properly in this photo but it is amazing, and I imagine even more so in the summer when its green! 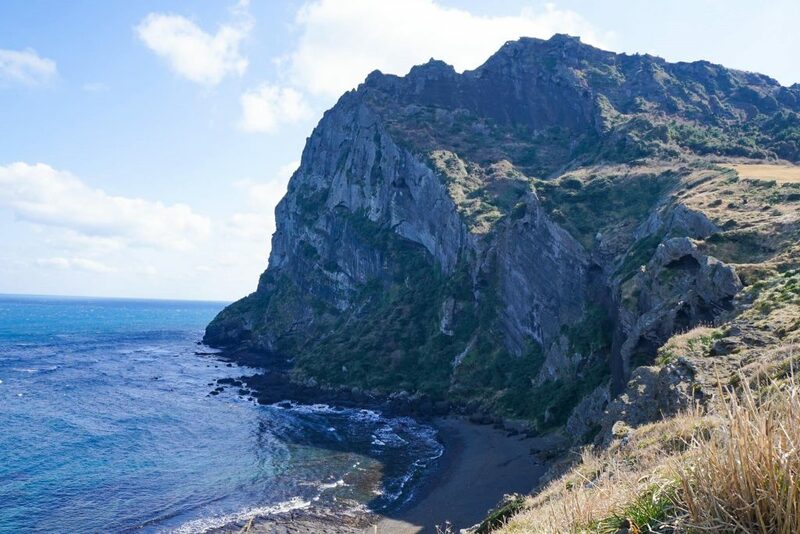 With the 99 sharp rocks surrounding the crater, its easy to see it as the gigantic crown of Jeju’s natural features (Yes this is one of Jeju UNESCO sites too!). The ridge-line provides an ideal spot for walks and you can even go horse riding as well, but the sunrise from the crater is the highlight and something not to be missed if possible. Like most of Jeju its a place that changes in every season explaining why many Koreans visit multiple times of the year, but possibly the best time is when the bright yellow colored rapeseed flowers cover the crater slopes in spring – Truly a sight to behold! Also not to be missed is the demonstrations of Jeju’s famous women divers (Haenyeo, literally “sea women”) and the opportunity to learn about the rare semi-matriarchal that developed here! 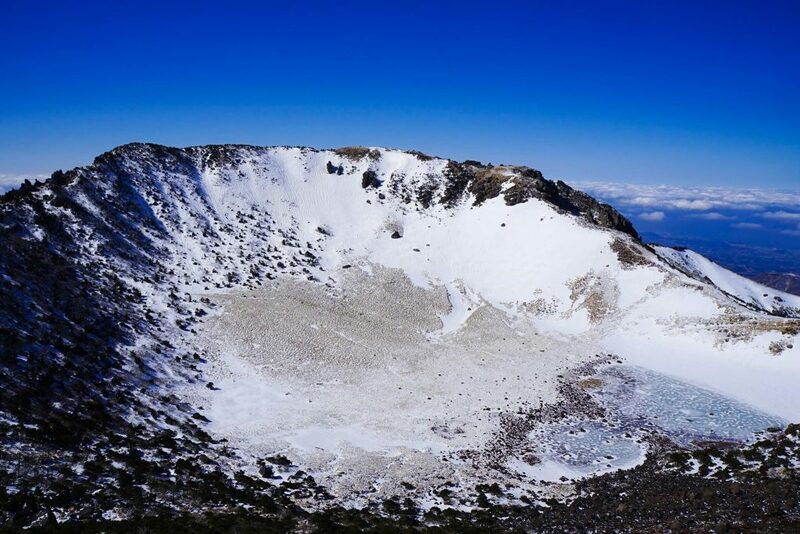 OK, its the dry season – But there normally is a crater lake! Still at least the view is first class! Hallasan Mountain takes center stage in Jeju Island and is perhaps the island’s most memorable landmark, visible from pretty much everywhere (when it’s not wrapped in clouds!). Also known as Mt. 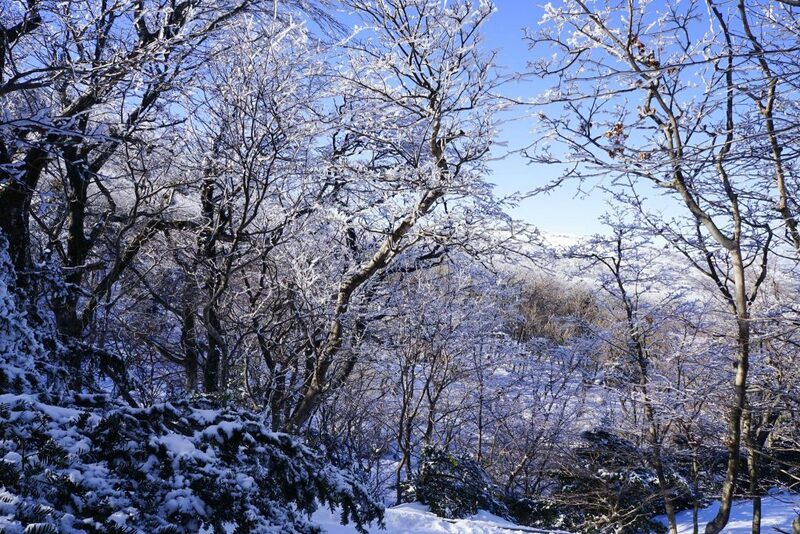 Yeongjusan, meaning “mountain high enough to pull the galaxy,” which is understandable given it is the highest point in South Korea! 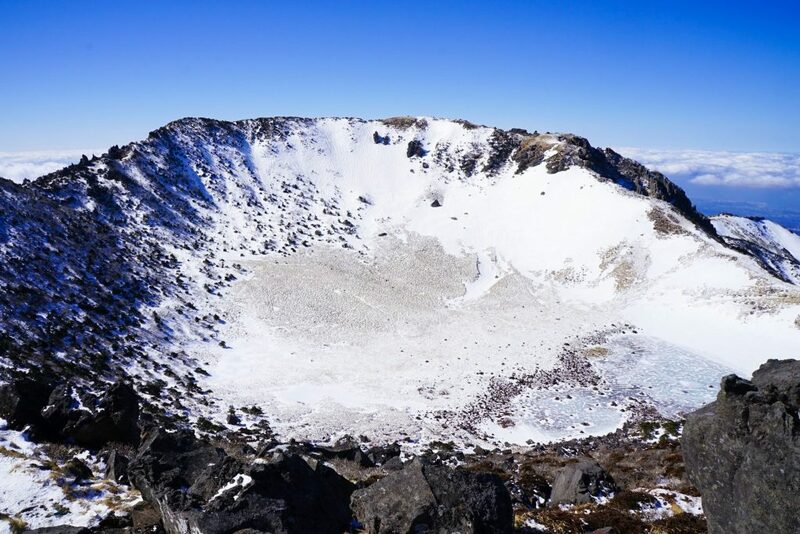 Hallasan Mountain was designated as a national park in 1970 and is widely revered for its geological value – there are 368 parasitic volcanoes called Oreums (peaks) around the main mountain! 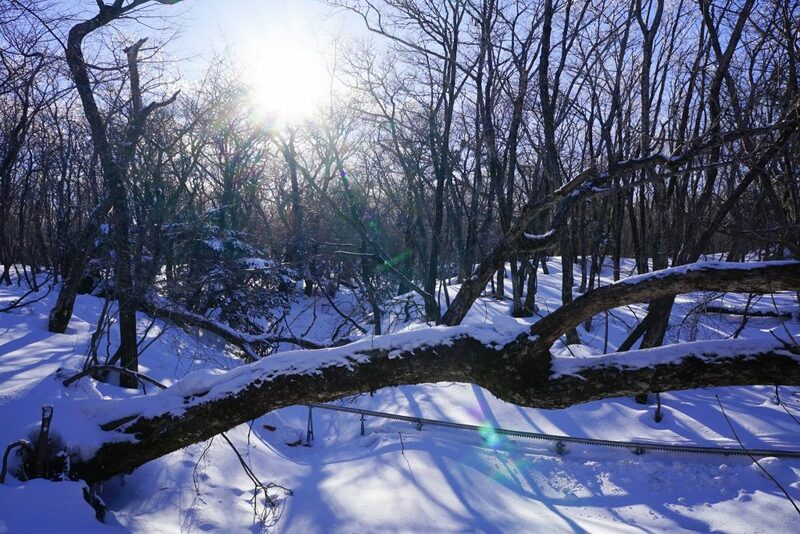 The area is also famous for its vertical ecosystem of plants that results from the varying temperatures along the mountainside and again, visiting in a different season changes the place entirely (though I personally liked the snow-covered look – climbing with crampons was a bit weird though!). Over 1,800 kinds of plants and 4,000 species of animals and insects have been identified and the best part is that to explore the mountain’s treasures all you need to do is follow one of the well-developed mountain hiking trails! It really is that easy – Everything is well marked and safe, even when covered in a foot of snow. Hallasan Mountain is relatively easy to hike (even I was able to manage it!) and many of the tracks are less than 10 km in length – It is completely possible to go to the peak and back in one day, as I did, but make sure you get an early start (8 am). However, the weather here is very fickle and brings a lot of wind, so make sure that you are well prepared for your journey – I was not at all and was lucky enough to make 3 new friends who feed, watered and generally just kept me alive!! 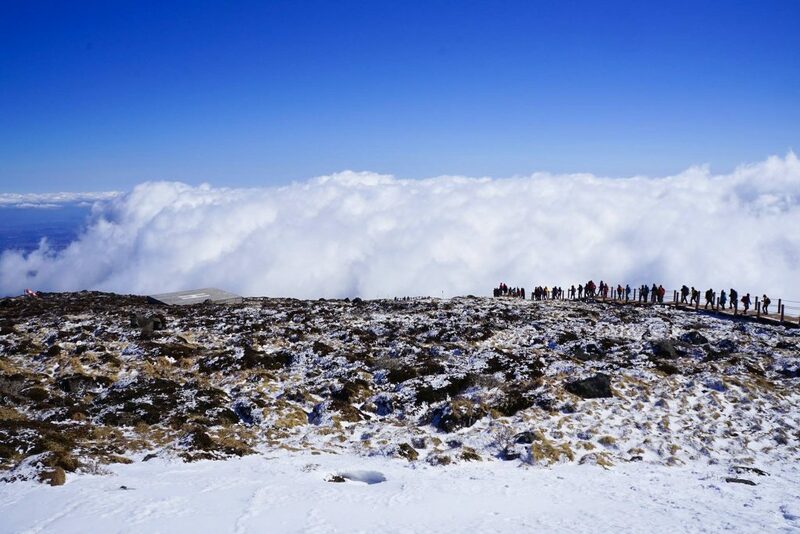 Literally feels like being in heaven – Way above the clouds. One of my favorite places in the entire world! Manjanggul Cave is one of the most extensive and best-preserved lava tunnels in the world and is absolutely mind-blowing! Seriously – Normally in lava tunnels or tubes you are bending over, crouching and getting cut / banging your head but here – No way! The tunnel is 3 km long and at least 10 m high and wide, it is just insane and like nothing else in the world. 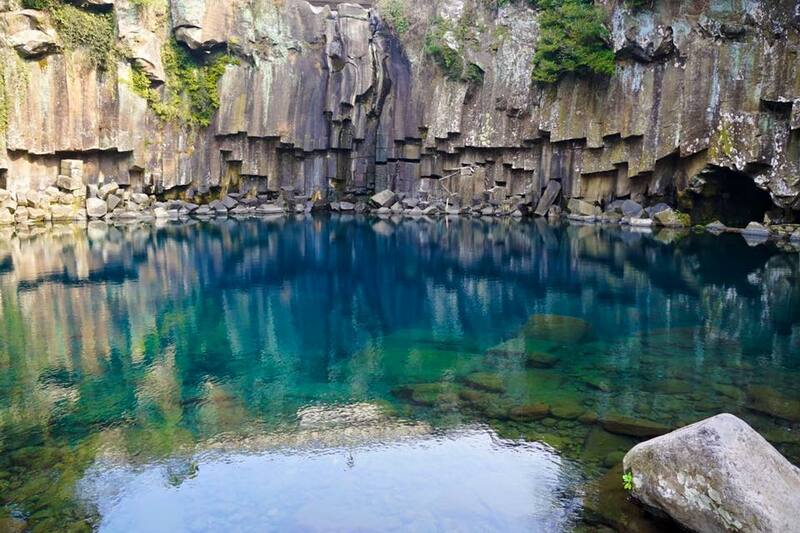 Something UNESCO recognized when they added to the Jeju UNESCO sites to their list. A lava tunnel is formed when the lava that was deep in the ground spouts from the peak and flows to the surface. Manjanggul Cave has a variety of interesting structures inside including 70cm lava stalagmites and the lava tube tunnels, as well as different coloration, vegetation and geologic formations that normally you can only read about in textbooks! Only 1km of the Manjanggul Cave is open to tourists to preserve it for future generation but this is enough to get a sense of the sheer scale of it. The inside of the tunnel sustains a temperature of 11~21℃, creating a comfortable atmosphere any time of year and while there are rare animals such as bats living in the tunnel, you are unlikely to see any wildlife here, except maybe a loud tour group! While there are many highlights “Stone Turtle” is especially eye-catching because it is shaped like Jeju Island, but the entire cave is a must do for anyone even with a passing interest in geology and geography (and even if you don’t, it is still just incredible to admire!). 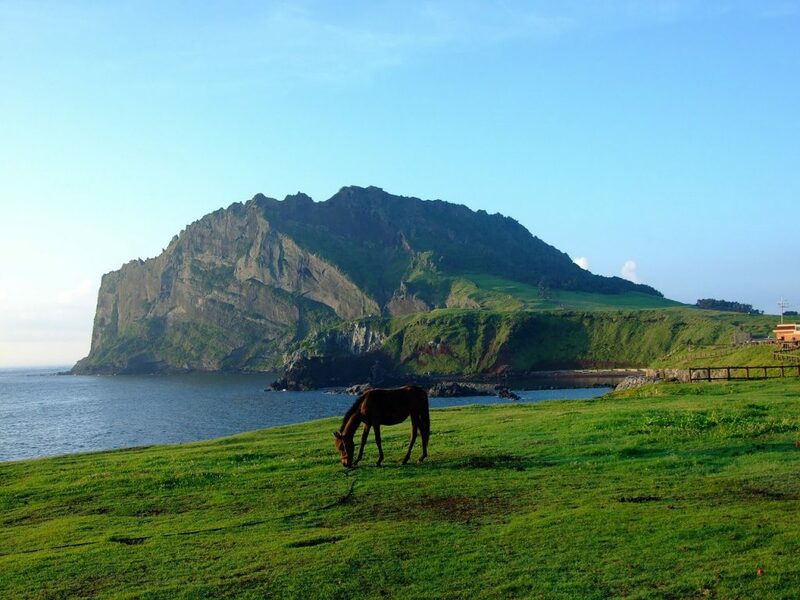 Not to be missed, this Jeju attraction is truly Korea off the beaten track! Seriously this is HUGE! Just overwhelmed by the grandness of it all! 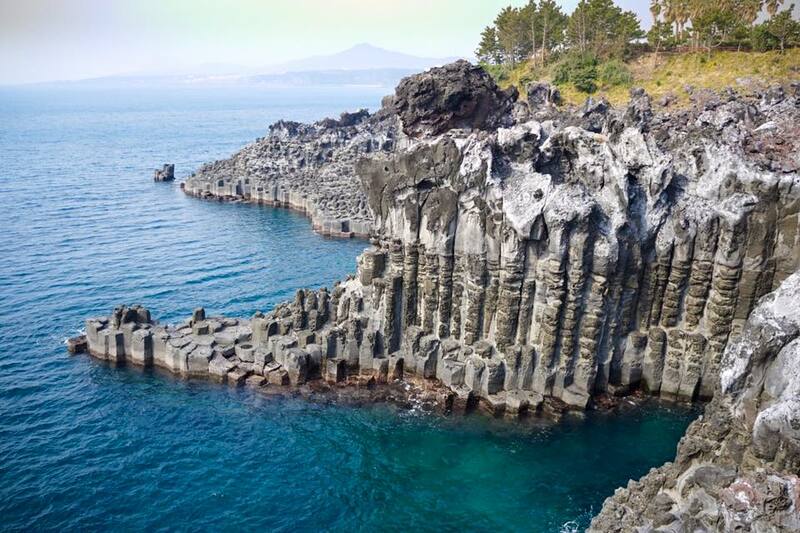 Jeju’s answer to the Giant’s Causeway in Ireland – the Jusangjeolli are imposing stone pillars piled up along the coast and is a designated cultural monument of Jeju Island. 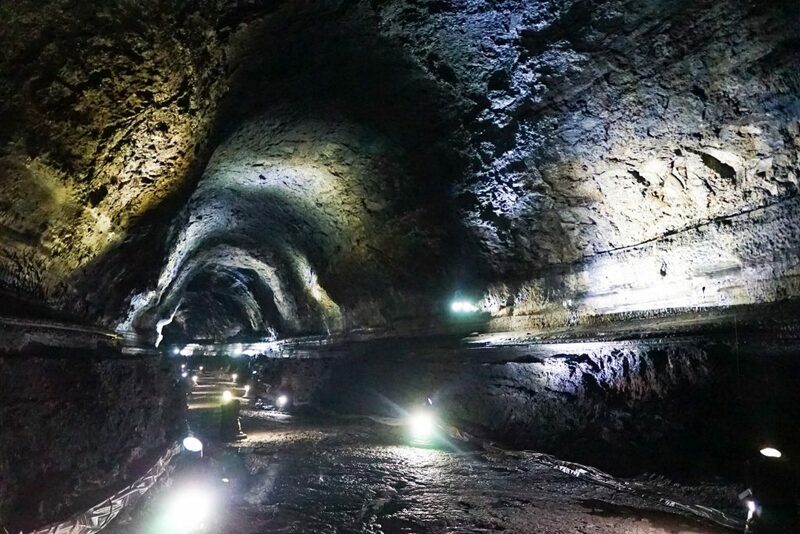 The Jusangjeolli was formed when the lava from Hallasan Mountain erupted into the sea with rapid cooling. They are rock pillars shaped like cubes or hexagons of various sizes and almost seem as if they have been carved out by human hands. The waves of the high tides crashing into the side of the cliff provide a breathtaking view of the ocean surrounding the pillars and is something other-worldly. 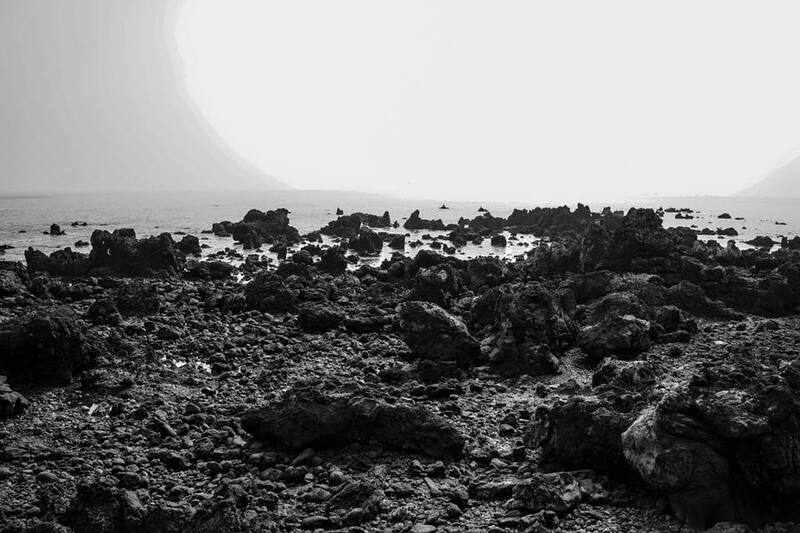 Like many things on Jeju, it is hard to find examples of this geologic activity around the world so don’t miss the opportunity. Pack a picnic even, or have some snacks to sit and contemplate life, and don’t forget to check out the surrounding coastline as while one section is most famed this does span for about 1 km in either direction. 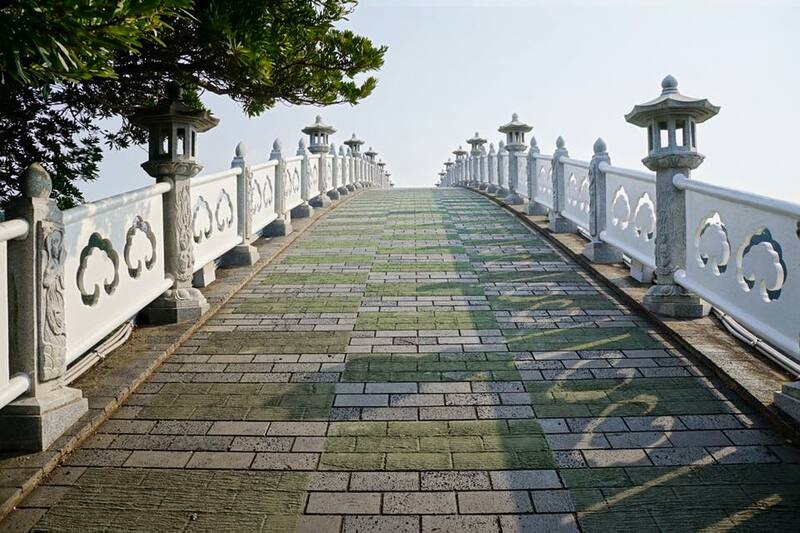 For the most active traveler looking for something unique and laid back, the Olle walking paths on Jeju are highly alluring. 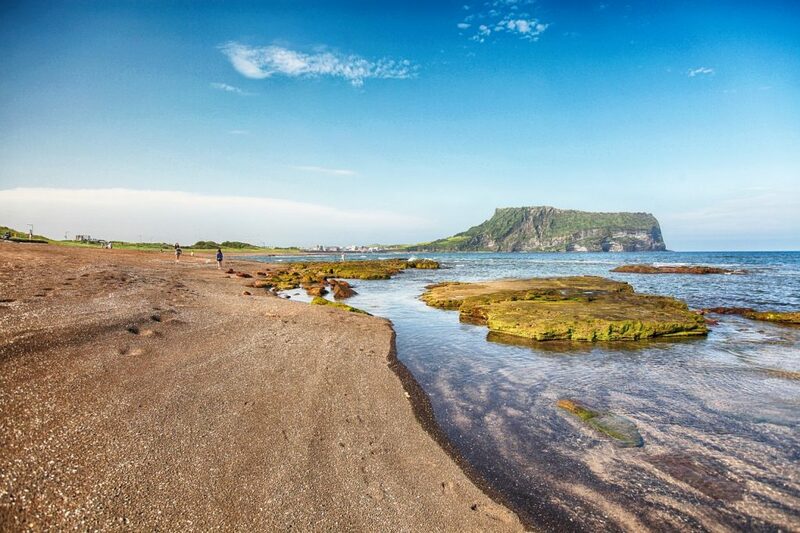 These are 200km of inter-connecting trails that will take you all along the south coastline of Jeju. The Jeju Olle, inspired by the famous Pilgrim’s Trail in Spain, was made from the ancient, forgotten paths across Jeju, most of which is now inaccessible by cars. 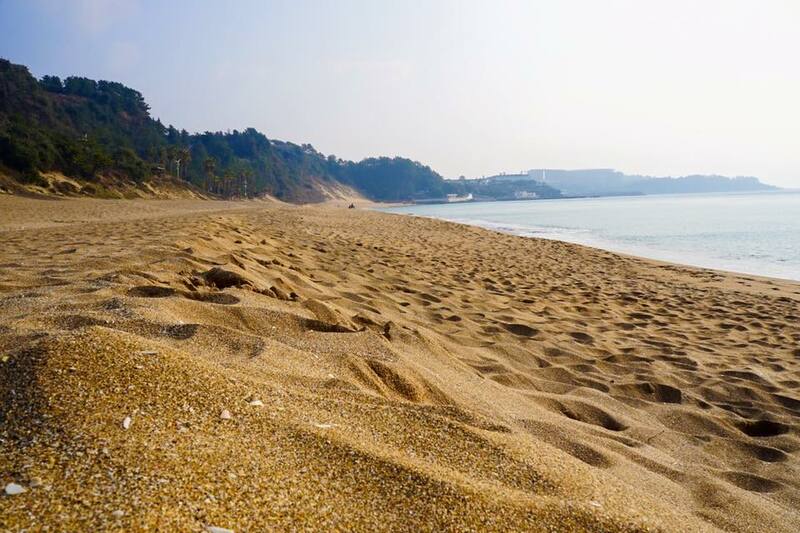 The route will take you to forests, mountains, beaches, and remote places and offer unrivaled views over Jeju’s unique, dramatic, volcanic landscape. They offer the chance to experience life at a slower pace and are a total escape from the hustle and bustle of some of the islands other attractions. Most of the paths are away from urbanized areas, and walkers are totally surrounded by nature and the tranquility. Some of the areas are almost untouched since this is the first time some paths have been open to the public. The paths are connected, so you can start your walk from where you finished the previous day. Really I will be going back here again as there is so, so, so much more to do and travel in Jeju Island is really easy – Let me know if you have been and what your favorite Jeju Island attractions are or if you have been inspired to check out Korea off the beaten track in the future! 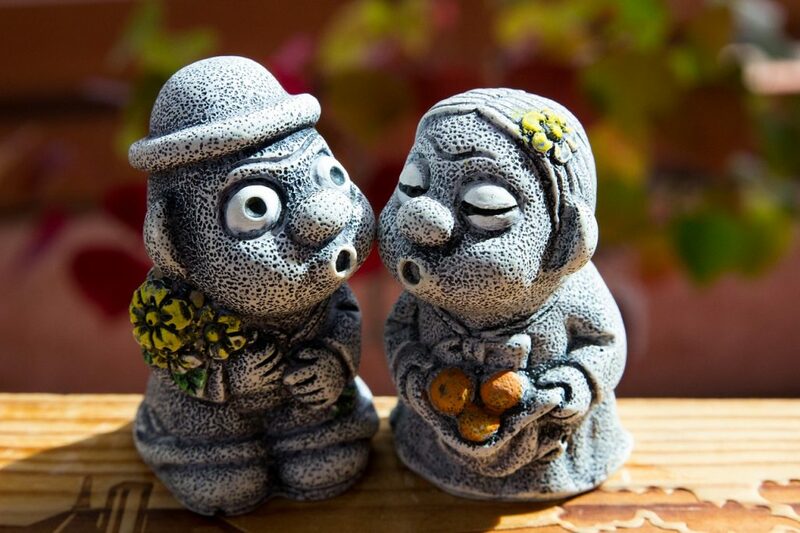 And don’t forget to book your Jeju Island accommodation in advance to avoid mission out! 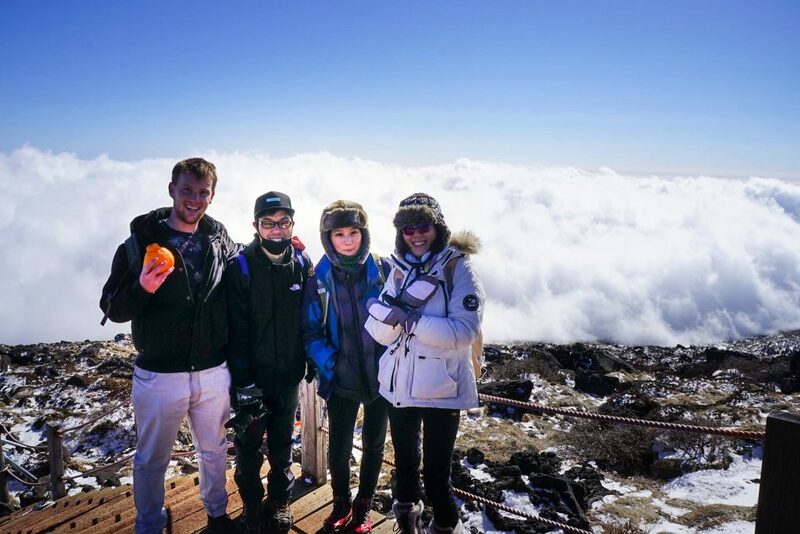 PS For those wondering why I am holding an orange, it’s a dekopon which is called hallabong (한라봉) in South Korea after Hallasan the mountain located in Jeju, where it is primarily grown. It’s amazing, in fruit and juice form! You will be sure to see it everywhere and be sure to try 1 … or 10!